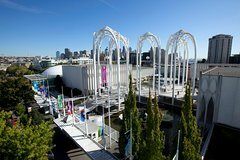 Pacific Science Center near the Space Needle in Seattle is Washington’s leading attraction for fun and engaging experiences for families and guests of all ages. Explore hundreds of interactive exhibits, wander among fluttering tropical butterflies, tinker with reusable products, touch live marine animals, come face-to-face with prehistoric dinosaurs, see a live science demonstration featuring liquid nitrogen, fiery explosions and more. For an additional fee, guests can experience Pacific Science Center’s planetarium, laser dome, two IMAX® Theaters and traveling exhibitions. • Explore hundreds of interactive exhibits including The Tropical Butterfly House, where guests can explore hundreds of beautiful, free-flying butterflies in a lush garden setting and experience the awe-inspiring transformation from pupae to butterfly. • Interact with live animals from Puget Sound waters while learning about their habitat, feeling their unique textures and discovering how they co-exist in our vital ecosystem. • See Science On a Sphere, an astonishing piece of technology that uses computers and video projectors to display dynamic animated images of the atmosphere, oceans and land on an illuminated globe six feet in diameter. • Roam among several moving, roaring, robotic dinosaurs in a life-like prehistoric environment, learning about their habitats and behaviors. • Explore how personal choices can positively affect your health and wellbeing through hands-on inventions, gadgets, activities and experiences. • Engage in live science experiments with our talented science interpretation team, featuring liquid nitrogen, fiery explosions, shattering tennis balls and more. • Splash into science with our outdoor array of fun water exhibits – move water uphill, shoot off water cannons and take a spin on our water wheel. For an additional fee, guests can explore outer space in Pacific Science Center’s planetarium; enjoy vibrant music and spectacular laser light shows in the Laser Dome; experience the immersive power of an IMAX® documentary on either one of Pacific Science Center’s two IMAX Theaters; or discover what's new in our traveling exhibition hall. Pacific Science Center’s café provides guests with a variety of pre-packaged and fresh-made food items and refreshments.